Titled as a series of acrylic awards that truly represent an investment in your employees, associates and business partners. These acrylic awards communicate your appreciation with a whole new light. 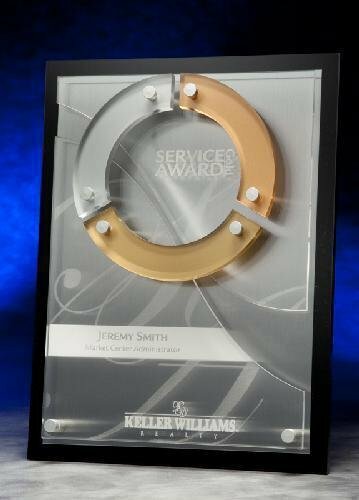 Often mixed with other materials such as aluminum, stone or chrome plated metal to enhance the appearance of these acrylic awards, you can see for yourself how slick these acrylic award designs are. 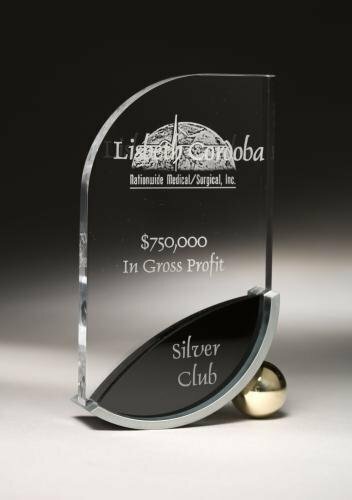 A very beautiful modern flame style acrylic award, 3/4' thick acrylic with a solid cast aluminum polished to perfection. Laser Engraved to a frosted white text. Full color imprinting available as an optional imprinting method for this acrylic award. Clear acrylic awards with either mountain peak or arch boasting 1" in diameter posts on either side of a 1/4" thick acrylic front. Adhered to a 3/4" thick base. A Stunning clear acrylic modern award design accented with black acrylic on a gold colored ball base. Full color imprinting available as an optional imprinting method for this acrylic award. 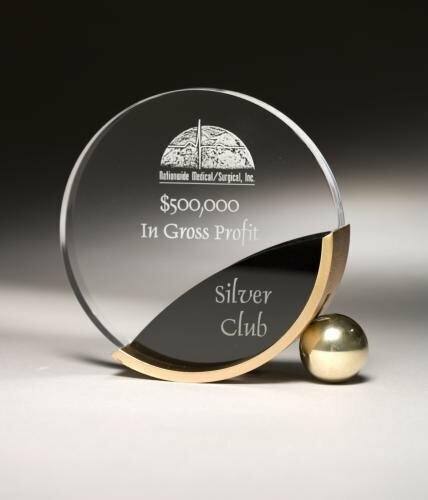 A Stunning clear acrylic circular award design accented with black acrylic on a gold colored ball base. Full color imprinting available as an optional imprinting method for this acrylic award. 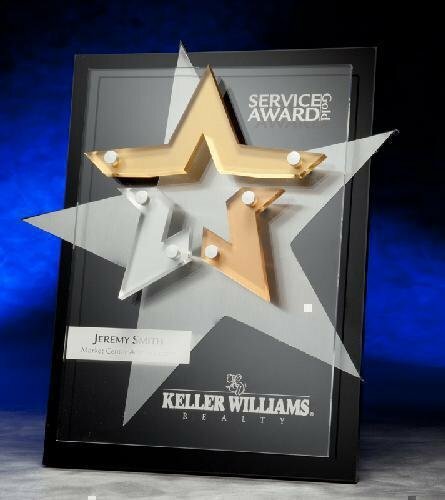 9" X 12" designer acrylic plaque award with multiple layers of stars, aluminum hardware accents this acrylic plaque award for a truly magnificent award presentation.